EastEnders fans were responsible for half of the top 20 most popular shows on BBC iPlayer during the festive season, with the New Year’s Day episode the most popular, generating 1.3 million requests. Programmes are on BBC iPlayer for 30 days – so data for programmes still available on BBC iPlayer outside of this period is not included. 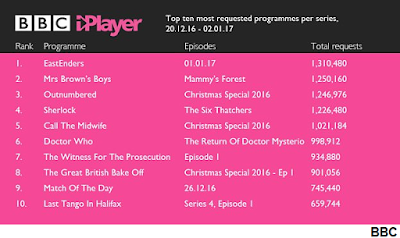 According to the BBC, connected TV users drove the majority of requests to the iPlayer, growing 7 per cent on 2015 to reach a weekly average in December of 7.48 million unique browsers. This was followed by tablets at 4.19 million, mobiles at 3.6 million, and computers 3.55 million. Mobile traffic accessing the live stream of the New Year's celebrations caused an 80 per cent spike around the turn of the year at midnight. Earlier this week, BBC Director General Tony Hall outlined his ambition to make the iPlayer the top online TV destination and to quadruple the number of requests to the service by the next decade.